A high power DC-DC voltage converter. 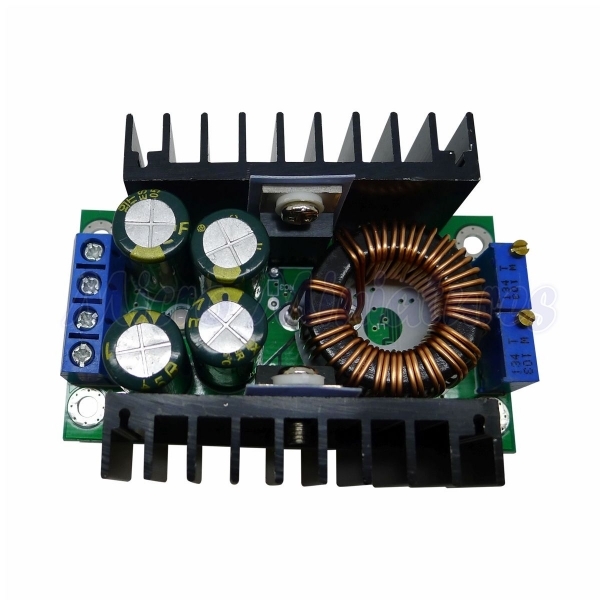 Rated 200 watts, this DC to DC converter will run continuously at 5 amps, but can also be operated up to 7 amps for short periods. The output voltage range is from 1.25 volts to 36 volts and can be precisely adjusted by the on board multi turn preset. (Note the input voltage needs to be greater than the expected output voltage ,i.e. 40 volts for a 36 volt output). Fitted with large heatsinks, this unit will happily operate all day within it’s ratings. The board has 4 mounting holes for screwing onto the back of a panel or inside a cabinet. Alternatively it can be secured by using self adhesive standoffs. Ideal for powering model railway accessories using a higher voltage power supply or forming part of a hobbyist power supply.